Have you signed up for these Gluten-Free Deals Programs Yet? If you haven't heard of Carol Fenster, then you're likely a VERY newly-diagnosed Celiac...for Carol is legendary in the gluten-free world. She is an internationally recognized expert on gluten-free cooking who now has a total of 10 cookbooks to her credit, including her latest release: 125 Gluten-Free Vegetarian Recipes. I've used her Gluten-Free Quick & Easy cookbook (not exclusively vegetarian), and one of our family's favorite dishes is the Orange Beef Stir-Fry, which can be served over rice, or even put in corn tortillas and served as "wraps" as we've done. 1.) Toast the quinoa in a heavy medium saucepan over medium heat, stirring often, until it becomes aromatic and begins to crackle, about 5 minutes. 2.) Add the oil and onion to the saucepan and cook over medium heat, stirring constantly, about 1 minute. Add the broth, garlic, cinnamon, and salt. Increase the heat to high and bring to a boil. Reduce heat to medium-low and simmer, covered, until the quinoa is tender and the liquid is absorbed, about 15-18 minutes. Remove from the heat and let cool slightly. Drain any excess liquid. Stir in the cranberries, ginger, pine nuts, and parsley. 3.) Combine the vinegar, oil, and agave nectar in a glass jar with a lid and shake until well blended. Transfer the quinoa to a medium bowl and toss with as much of the dressing as you like. Add salt and pepper to taste. Serve warm -- or chill overnight, then let stand at room temperature for 20 minutes -- and garnish with the parsley and pine nuts. Serves 8. Calories 220. Fat 10g. Protein 5g. Carbohydrates 29g. Cholesterol 0mg. Sodium 124mg. Fiber 2g. Reprinted with permission from 125 Gluten-Free Vegetarian Recipes by Carol Fenster (Avery/Penguin Group, 2011). 125 Gluten-Free Vegetarian Recipes will be a staple for families who blend gluten-free and vegetarian lifestyles. And because it caters to both groups, this cookbook is a perfect place to get recipes you can make when visiting friends and family. Whether they are gluten-free, vegetarian, neither, or both, these easy recipes will satisfy a range of tastes, as either a main course or side dish. (Carol shares instructions for adding small amounts of meat, fish, or poultry to her recipes.) And almost all the recipes can be made with ingredients that are easy to find, even if you aren't within driving distance of a specialty grocery store. Carol said the soup is, "Cool and refreshing as an entrée for a summer luncheon, or served in espresso cups or shot glasses as an appetizer before dinner. This super-easy soup is absolutely tantalizing...the sweetness of the apple juice both balances and accentuates the dill. Dried dill won’t cut it here; use the real thing." 1.) In a medium saucepan, combine the apples, apple juice, lemon juice, agave nectar, and salt. Bring to a boil over medium heat and simmer, covered, for 8 to 10 minutes, or until the apples are tender. Let cool for 10 minutes. 2.) Place the apples, cucumber, sour cream, and dill in a blender and process until very smooth. Chill overnight, or for at least 3 hours, to meld the flavors. Serve chilled, garnished with thin slices of cucumber and a small dill sprig for garnish. Serves 4 as a main course; 8 for appetizers. Calories 195. Fat 3g. Protein 4g. Carbohydrates 39g. Cholesterol 12mg. Sodium 188mg. Fiber 3g. Reprinted with permission from 125 Gluten-Free Vegetarian Recipes by Carol Fenster (Avery/Penguin Group, 2011). Aside from her recipes she can take "on the road" (when she has access to a kitchen, of course! ), I asked Carol if she had any gluten-free travel tips to share. “Never leave home without it,” was her response. She always carries back-up food with her, especially when boarding an airplane, but also when traveling by car. "My plan includes the assumption that there will be no food to eat on the airplane. I can’t even depend on Southwest peanuts anymore, since they now serve a roasted version that includes wheat starch! So, I always bring the following gluten-free items with me in my purse: dried fruits, plain nuts, crackers, jerky, and at least one huge muffin. When I bake muffins I always put a few in Ziploc bags and freeze them, then put one in a plastic tub that buttery spread comes in. I’ve never been 'held in captivity' on the tarmac for hours on end, but always want to be sure I would have enough food to survive that ordeal if it ever happens to me. "Another trick I just learned is to put a serving of quick-cooking oats (gluten-free oats, of course) into a small container (along with your favorite add-ins like nuts, brown sugar, dried fruit, cinnamon, a little salt, etc.) and carry it on board. Get hot water from a flight attendant and add it to your oatmeal mix (or use the coffee cups provided by the airline). Cover and let it soak for a few minute and you have a much better breakfast than any of the other passengers. Always have a plastic spoon in your purse, too, for this purpose!" Carol said that lately she's had such good luck at restaurants when traveling. But she knows that, if all else fails at a restaurant, she can be satisfied with plain grilled fish, plain steamed vegetables, and no dessert -- and then return to her hotel room to eat some of her “stash.” She likes the GoPicnic kits, especially the one with hummus in it, and often keeps one in her suitcase. "As I have said countless times before, if there was ever a time to be gluten-free, it’s now," Carol remarked. "All it takes is a little planning with the many resources available to us, and you can satisfy your wanderlust safely and deliciously." 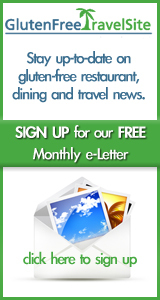 As publishers of the Gluten Free Travel Blog and GlutenFreeTravelSite, we couldn't agree more! Carol's cookbooks can be purchased at most bookstores and online booksellers like Amazon.